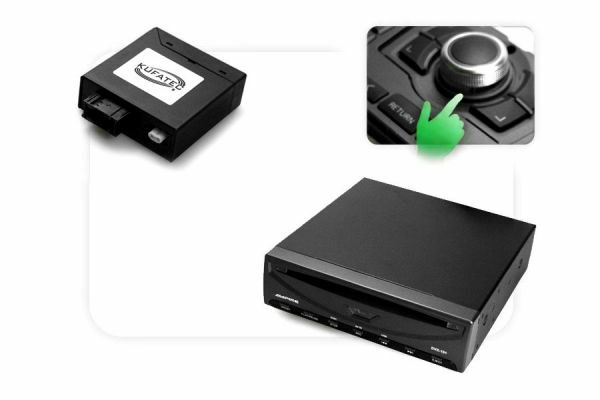 Product information "DVD Player USB + Multimedia Adapter - with OEM Control"
Multimedia bundle including DVD-Player as well as multimedia adapter LWL version "Plus"
Note MMI 2G with hybrid TV: Not suitable for vehicles with factory fitted hybrid TV tuner. In case of factory fitted hybrid TV tuner item number 33945 needs to be used for fitting the DVD-Player. Item number 35600 is not needed in that case. Note MMI 3G with TV: The item is not suitable for vehicles with factory fitted TV. Item number 33945 needs to be used for fitting the DVD-Player. Customer review for "DVD Player USB + Multimedia Adapter - with OEM Control"
Properties: "DVD Player USB + Multimedia Adapter - with OEM Control"
Installation manuals for "DVD Player USB + Multimedia Adapter - with OEM Control"